The bulls had a great start into 2010 - the Nasdaq soared more than 2% this week. I had to adjust the count a little bit (I replaced minor wave B), but all in all I'm very happy with the first trading week in 2010. 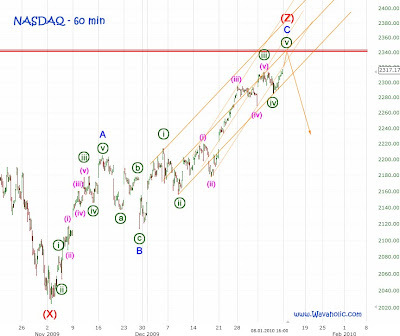 As expected in last weekend's post the impulse started on December 12th was finished when the Nasdaq hit the middle trendline. However it turned out not to be the top of Intermediate wave (Z) but only the top of wave [iii]. So, another correction followed (wave [iv]) and on Thursday wave [v] started. Wave [v] can end anytime in the next few days and will be very likely over when the market drops below the low of wave [iv] (2285.23). So, I'll be watching for a drop below 2285.23 to enter short positions.